Matching the soprano’s exploits was violinist Augustin Hadelich, who had an astonishing solo turn in Mozart’s fifth violin concerto; it was both technically and musically impeccable. As the final sign of his consummate musicianship, Hadelich played his own fascinating cadenzas, daringly laden with double-stops. A nightcap of Paganini’s ninth caprice, nicknamed “La Chasse,” a further study on double stops, was the perfect finish. The concert featured the third Stradivarius I’d heard in six days […] and Hadelich was the first to fully understand and exploit what he had in his hands. Playing without a shoulder pad and with pinpoint intonation, he produces a fresh, ringing sound that changes color as the music demands. Although each string had a different “voice,” Hadelich’s bow control allows him to paint consistent lines throughout every register when necessary. Yet the range of qualities he found just in the orotund bottom string sounded like several different violins. The security of his double-stops in the slow movements of the Brahms and Poulenc sonatas was stunning; two good violinists playing together could not have sounded more expressive. […] The essence of Hadelich’s playing is beauty: reveling in the myriad ways of making a phrase come alive on the violin, delivering the musical message with no technical impediments whatsoever, and thereby revealing something from a plane beyond ours. This was the best recital I’ve heard this season. 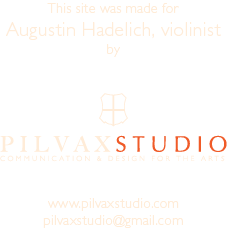 Augustin Hadelich is in touch with the sunny side of a violin. He can dig in; he can probe; he can make the instrument bark when the music calls for it. But his default seems to be the warm lyrical joy of lilting melody. The 24-year-old made his Kennedy Center recital debut on Sunday evening with a program that included one from every column of the virtuoso menu, from Bartók's final, wrenching, unaccompanied sonata to the fireworks of Sarasate's "Carmen Fantasy." But the opening Beethoven Sonata No. 8 in G set the general tone: as happy and un-neurotic a piece as Beethoven produced, certainly in these hands. ...Certainly he is not a standard-issue virtuoso. He has tremendous technical fluency, but he reaches far beyond that, putting it in the service of articulate, even poetic communication. The Bartók, for me a highlight, contained a universe of different kinds of sounds: feathery little bow strokes; a gritty bark at the beginning of the second movement's challenging fugue; a thin gentle line, clear and singing, in the lyrical meditation at the heart of the third movement. Intense, even searing, as his performance was, it was never a downer; there was an inner sense that this particular journey came out all right in the end, despite a slip of the bow at one point in the final movement. ...The Prokofiev, another generally wholesome piece, bracing and smacking sometimes of toy soldiers, was followed by the Sarasate, which Hadelich made into something more than pure fluff. He conveys a sense that music is worthwhile; and his sunniness derives, perhaps, from bearing talent like a gift, rather than a weight upon his shoulders.